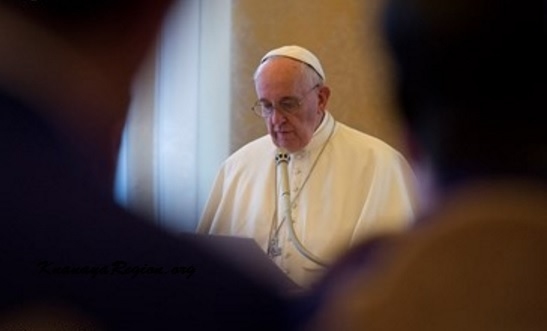 Pope Francis used the analogy of a mobile phone with battery running down and losing internet connection, to hit home his message of how to stay connected to Christ when faith begins to waver.“Without a connection, a connection to Jesus,” the Pope said, “we end up drowning our thoughts and ideas, our dreams and our faith, and so we get frustrated and annoyed,” and our hearts begin to falter. But the Pope cautioned, “Never think that you have nothing to offer or that nobody cares about you.” Citing Chilean St. Albert Hurtado, he said it is the devil who makes us feel worthless. Pope Francis offered the young people the words of Hurtado as the password to log on: “What would Christ do in my place?” This they can ask themseles at school, at university, outdoors, at home, among friends, at work, when taunted, the Pope said, “He is the password, the power source that charges our hearts, ignites our faith and makes our eyes sparkle. And the only way not to forget the password, the Pope said, is by using it over and over, day after day. A time will come, he said, when without realizing it, your heart will beat like Jesus’ heart and live the way Jesus lived. Time and again, in his talk, Pope asked the young people their password. Pope Francis offered young Chileans several Gospel models to follow. He urged them to be young Samaritans, who never walk past someone lying on the roadside. He told them to be young Simons of Cyrene who help Christ carry his cross and help alleviate the sufferings of their brothers and sisters. “Be like Zacchaeus, who turns his heart from materialism to solidarity. Be like young Mary Magdalene, passionately seeking love, who finds in Jesus alone the answers she needs. Have the heart of Peter, so that you can abandon your nets beside the lake. Have the love of John, so that you can rest all your concerns in him. Have the openness of Mary, so that you can sing for joy and do God’s will,” the Pope said. Before concluding, Pope Francis once more reminded the young men and women not to forget their password.